Why do auto comparisons by auto journalists not use the same tire on all of the vehicles?? I love reading comparisons (or watching the videos) that different automotive publications put together. Some of my favorite are from Everyday Driver but I also enjoy the scale of the Motortrend ones. Of course Jalopnik has done these as well. Every time, I look through a spec comparison sheet at some point and observe that each car has a completely different tire! While they may have “comparable” tires, I have found that aside from driver skill, the choice of tire is the most important factor for a car. Sure in this case, someone like Randy Pobst at the wheel as the test driver it might not REALLY matter. But I just find it interesting that they compare cars in terms of very specific metrics, even though tires alone can be good for a few seconds around a track easily. Might as well put all of the cars on the same set of street tires in the car’s appropriate size. I think it’s silly to even consider the “OEM tire” as part of a vehicle’s actual performance. Especially since metrics like tire treadware are not actually regulated and tire technology has advanced to crazy levels. Many of the subjective points in the reviews would end up about the same but it would just make me so much more sure of the lap time differences. 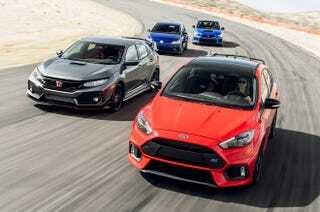 Also,extremely cool that the Type R won hand-over-fist in this comparison. I have loved all of the glowing reviews and even with its ludicrous “gundam styling” I actually kind of love it. I have only seen one in person so far and it was even better than the photos for sure. I’d love to drive one some day. The new Civics are way too large for my taste but so is just about every new car aside from the ND Miata or 86 twins.